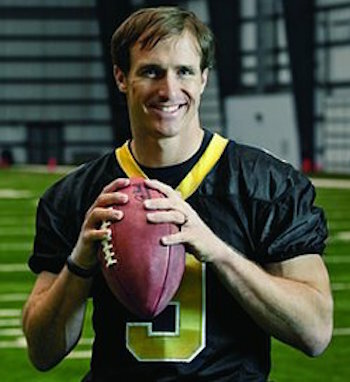 Is Drew Brees a Dome Quarterback? Weekly consistency is the key to success in any fantasy football league. When you draft a team of players with high weekly point variances, you have chosen the quickest path to a fantasy ulcer. As these high variance assets cannot be relied upon to serve as a foundation for a fantasy football championship, you should forgo these “feast or famine” players in your drafts . Fantasy footballers often place New Orleans Saints’ quarterback Drew Brees into this high-volatility category. A common held belief among Brees’ detractors asserts that his play suffers when not in the controlled weather environment of a dome stadium. But is this belief fact or fiction? Those statistics are fantasy football nirvana. In current mock drafts, Drew Brees is creeping off the board outside the top five quarterbacks, often available in rounds six or seven — an incredible value for a quarterback with a 4,500-yard/30-touchdown floor. Many fantasy owners base their draft day decisions on end of year statistics, either from the prior season or those projected for the upcoming season. This is an acceptable strategy for a casual fantasy football fan; however, if you are reading this article, you are likely more than a bystander. Identifying trends among star players such as Drew Brees could be the corner stone for vital decisions on draft day. I usually wait to select a late round quarterback, but when Brees’ name pops up in the queue in the middle rounds, I need clarity to make the right decision. Let’s settle this debate once and for all. First, I separated out all of Drew Brees’ dome games and non-dome game over the last three years. Here are his year by year totals and his summative three year totals for the split. I made two adjustments before compiling the data. First, I eliminated all Week 17 performances as they are not fantasy relevant games. I also eliminated the game at Carolina in 2015 because an injured Drew Brees did not play. Drew Brees’ attempts and completions were almost exactly the same inside or outside of a dome stadium. Brees averages about four more attempts and completions per game, which is not a huge difference. Surprisingly, his completion percentages are also close to the same, even with some cold weather winter games (at Chicago, at Pittsburgh, at Seattle) over the past three seasons. Drew Brees averages two touchdowns per game outside and less than a third of a point more (2.32) under the dome, a surprisingly small difference. Equally as surprising, his interception rate in non-dome games (0.81 per game) is almost the same as the dome games (0.92). Drew Brees yards are definitely higher in dome games, with his average total per game going from 282.9 to 332.9. This is partly due to increased attempts as all teams, including Saints opponents, call more plays and score more points in the temperature-controlled, windless dome conditions. Brees has also enjoyed better offensive line play in dome games, where he is sacked 1.97 times per game versus 2.5 times per game in non-dome games. Most importantly, however, fifty yards matters more in real life than the two extra points per week gained in most fantasy football formats. My overall verdict? There is very little fantasy difference between Drew Brees’ fantasy performances in dome stadium or non-dome stadiums. In 2016, the Saints will play their hardest schedule of the past four seasons. They only have nine dome games, and many of those are against strong opponents (Seattle, Denver, Carolina, at Arizona). If you have concerns about Brees’ performance decline due to age, that is understandable on the surface, however the advanced accuracy data disagrees. Brees’ 48.0-percent deep ball completion percentage on PlayerProfiler.com. Drew Brees is currently the 83rd player selected on MyFantasyLeague.com early drafts. He is currently drafted after the oft-injured Ben Roethlisberger (who has only thrown for 30-plus touchdowns twice). Brees is also being selected in the same vicinity as Tom Brady, who will miss weeks 1-4, and Blake Bortles, who led the league in interceptions in 2015. If you are looking for a durable quarterback who will throw for a ton of yards, score 30-plus touchdowns, and sit on the draft board until round six or later, Drew Brees is your guy. Most importantly, disregard the “Dome QB” narrative and confidently draft and start Drew Brees in your fantasy football league whether he will be playing under a dome or outside on natural grass.